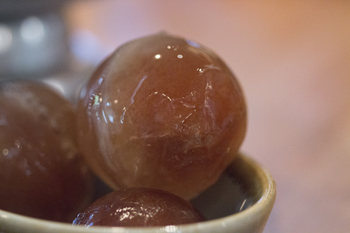 Image: Angostura Ice Balls. Photo by Kathy Casey. Want to impress your guests? Glean these tips and recipes for nicer ice. Ice has been called “cocktail’s last frontier.” No longer an oversight, ice is actually a crucial component in drinks (witnessed by the popularity of silicone trays, sphere ice molds and crystal clear cocktail ice delivery services popping up in cities all across the country). Sometimes you want it to do more than chill or dilute a drink, so regular frozen water won’t cut it. But by adding herbs, fruit, juices and other ingredients, ice is able to play the role of mixology magician, slowly changing the aroma, flavor and appearance of a drink from the first sip to the last. Presto, change-o! Recipe courtesy of Torrence Swain, Head Bartender, Bourbon Steak, Washington, D.C. Photo courtesy of Bourbon Steak. Swain generally makes flavored ice cubes that will allow the drink to slowly develop different nuances as it melts. “I always begin considering how the ice cubes should influence the cocktail and then create the cocktail recipe with the desired effect in mind,” he explains. 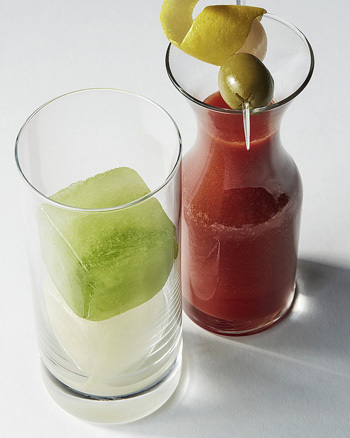 This Bloody Mary gets its spicy kick and fresh vegetal notes from horseradish and celery ice cubes. Combine the vodka, tomato juice and spice mixture in a soda glass. Stir, and add the celery ice cube and then the horseradish ice cube. Serve in carafe tableside. Combine 16 oz. celery juice and 8 oz. filtered water in a 2-inch by 2-inch ice tray. Allow the liquid to freeze, and remove the cubes from the tray. Place in a large plastic bag and store in freezer before use. Cook 1 cup of rice for 10 minutes in the amount of water called for. Drain and reserve water. Combine 12 oz. filtered water, 4 oz. finely grated horseradish and 8 oz. rice water, and place in a 2-inch by 2-inch ice tray. Place in a large plastic bag and store in freezer before use. The ice for this drink consists of a cucumber ice rod made by filling long plastic bags (available on amazon.com) with cucumber water, then tying and freezing them. “[They] are an inexpensive way to create a unique ice that slowly enhances the flavor of the drink as it melts,” says Casey. Measure gin, Monin Watermelon Puree, simple syrup, and lime juice into a pint mixing glass. Fill with ice, cap, and shake. Add soda to tin then strain into a Collins glass. Add cucumber ice rod and garnish. Combine 4 pumps Monin Cucumber Concentrated Flavor with 4 cups water. Pour into 6-inch candy ice bags and freeze until ready to use. In a pitcher, measure water and bitters. Pour water in ice ball or large format square silicone molds. Put into freezer. Once frozen, remove ice from molds, store ice in large zip lock bags, and keep frozen until ready to use. This is a delicious and sophisticated punch. 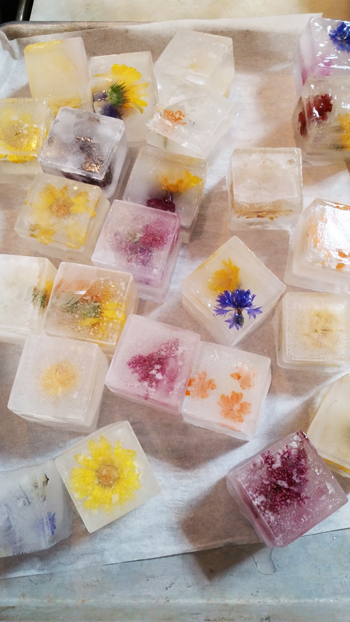 For individual service, Casey suggests pre-batching the punch base and then serving it over large format ice cubes frozen in square silicone molds and studded with edible flower petals and mint. In a large pitcher, combine the honey and warm water; stir until well dissolved. Then add the lemon juice, gin and elderflower liqueur. (At this point you can refrigerate the punch for service up to 3 days in advance). When ready to serve, pour the chilled mixture into a punch bowl or large drink pitcher (You could also split it between 2 pitchers and add half a bottle of Champagne to each.) Serve over ice and garnish with lemon twists. 1. Be sure the mixture for the ice has enough water content so the cubes freeze hard. “Using too much of a puree or other ingredients like syrups can impede the freezing process,” she says. Cut lemon peel into stars. 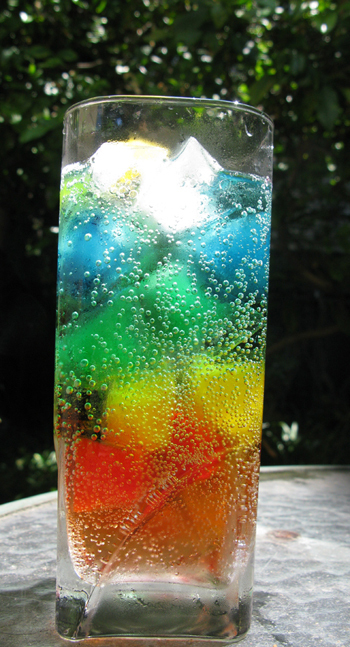 Add all ingredients to a glass filled with ice in rainbow order (2 cubes per color, making a double complete rainbow). Garnish with lemon stars. Add food coloring to an ice cube tray, filling with water and freezing. 1. Freeze coconut water for summer rum drinks.